I never thought I would see one of our donors – a seasoned attorney – jumping on a trampoline with a Gates daughter. But at this event, I walked into the room at just the right time. At United Way of King County, we successfully employed “donor appreciation events” to thank our current donors and invite some prospective donors to hear about our work in the community. We were fortunate that some very wonderful donors opened their homes to this type of “ambassador” work and became more deeply engaged. These Alexis de Tocqueville Society events, held about twice per year, usually had between 60 and 80 guests. 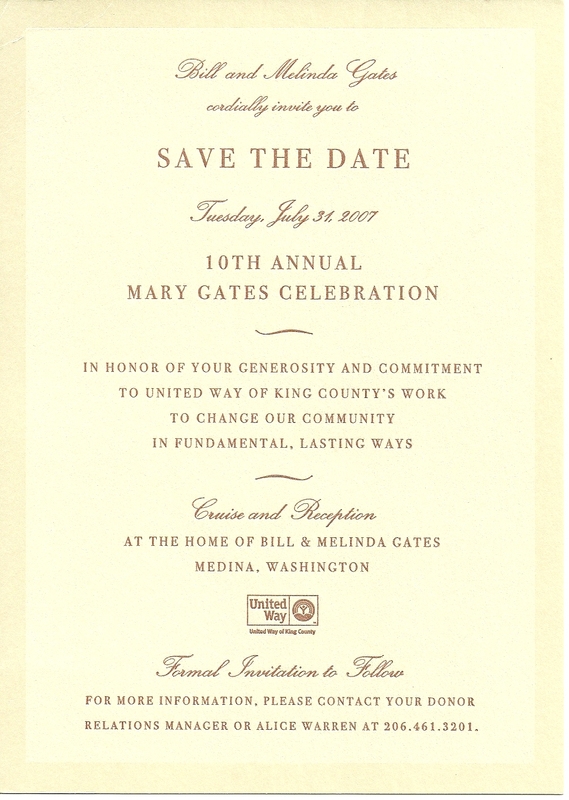 Another donor event, the Mary Gates Circle, was held in the late summer and thanked donors giving $25,000 or more annually (named after the long-time board member, Seattle philanthropist and mother of Bill Gates). On the 10th anniversary of the founding event, Bill and Melinda offered to hold this event at their new home in Medina, Washington. The event offered the perfect opportunity to re-engage lapsed donors and talk to current donors about their giving for the year. As a Relationship Manager (aka major gift officer), I was working to ensure every one of my donors who had the capacity and inclination were able to pledge, give and attend. Even before the Save the Date card was sent, I was in touch with everyone in my portfolio. With the regular fundraising, we were also working to complete the Gates Challenge Endowment (more info here and here) which offered additional giving opportunities. And there was a triple match for Microsoft Alumni that year; a gift of $6,250 from a Microsoft Alumni donor would match to a $25,000 gift. That year United Way of King County ended with a record fundraising year. Of course, the Gates’ are incredibly generous with their time and treasure and they host events for a few charities they hold dear. Privacy and security are tantamount; guest names had to be submitted beforehand, no cameras allowed, everyone was to arrive by boat, courtesy of the Gates, any late comers would be left. In the end we had about 350 on the guest list. With so many donors over such a large home (66,000 sq ft) and lawn even identifying one’s own donors in the crowd was difficult, much less having a moment to say hello and talk. The home… amazing. The library was open so guests could see the collection, including a copy of the Codex Leicester. Room after room, each with spectacular details. And then… The trampoline room. It appeared a bit like any other room, except after about 4 feet of perimeter of “normal” flooring the entire floor was a trampoline. One of their daughters was lightly jumping up and down and everyone is the room was watching, as if they had never seen a trampoline before. “Come on,” she said, and no one moved. “It’s fun!” That’s when the lawyer took off his shoes and started to bounce. Pure joy! 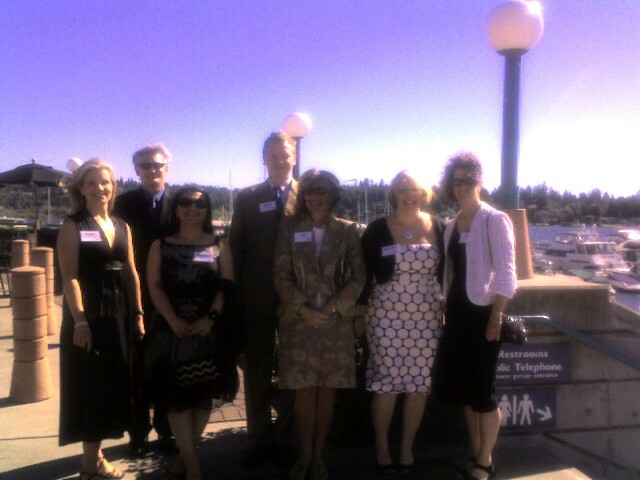 The relationship managers: Karen, John, Mahnaz, Roger, Ruby, me and Anne. Later, it was time to for Melinda and Bill to thank everyone, then Campaign Co-Chairs Jeff and Tricia Raikes thanked everyone donors for a record-breaking campaign, and we were back to the boats. It was the best donor thank you event I had ever attended. 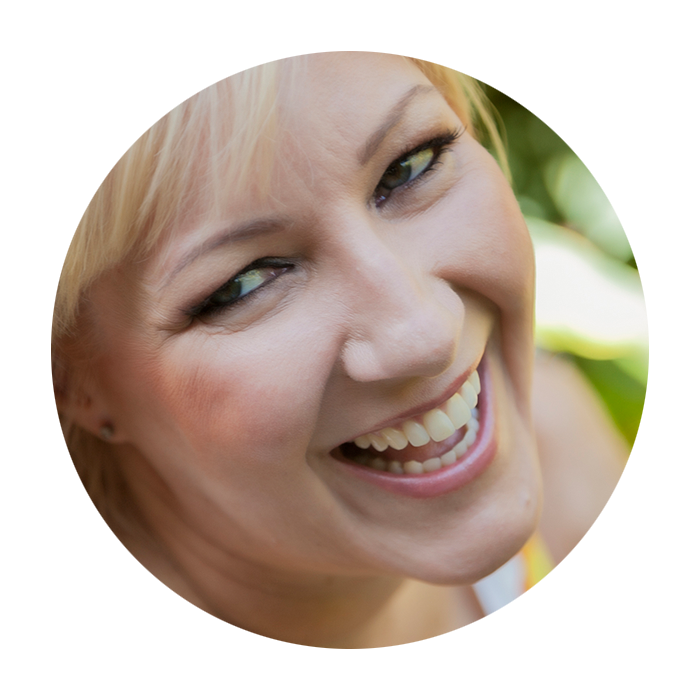 Events can be expensive and a massive expenditure of staff and volunteer time. Having a donor step up and host the event, covering all the expenses and arranging catering, valet parking, etc. can delight both the hosts and the guests. Including your best donors as joyful ambassadors and hosts can help your organization create an unforgettable donor event! Care to share an amazing donor thank you event?